Viktoria Poliova has written three symphonies, the ballet Gagaku (based on Ryunosuke Akutagawa’s short story Jigoku hen [Hell Screen], 1918), and countless orchestral, choral, vocal, and chamber pieces. Today she ranks with Ukraine’s most interesting and spectacular Ukrainian composers. She was raised in a family with serious musical traditions (her grandfather, Petro Mohyla, is a singer with the Veriovka State Ukrainian Folk Choir under the pseudonym of Valerii Poliovy; her father is the composer Valerii Poliovy). She also embarked on a music career and became an acknowledged and talented composer. Her works are marked by intense drama. Her music is born of a spiritual effort; here the catharsis receives powerful primeval energy. 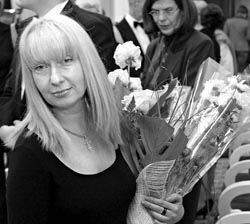 Her compositions are performed by leading Ukrainian and foreign academic and chamber orchestras. This Kyiv-based composer’s opuses embellish contemporary music festivals in Ukraine, Russia, Sweden, Finland, Switzerland, Italy, France, Poland, United Arab Emirates, US, Peru, and Chili. Her music is put out by the Swiss publishing company Sordino Ediziuns Musicalas. In 2005, the world-famous violinist Gidon Kremer included Viktoria Poliova’s Warm Wind in his concert cycle Sempre Primavera. It was performed by Kremer, Andrei Pushkariov (vibraphone), and the chamber orchestra Kremerata Baltica during concerts in Paris, Vienna, Berlin, Dresden, Madrid, Valencia, Shanghai, Seoul, Singapore, and San Francisco. On December 5, her Ode to Joy (for soloists, mixed choir, and symphony orchestra) was performed during a gala concert in commemoration of the fall of the Berlin Wall, organized by the German embassy and those of the WW II Allies. Owing to Poliova’s creative endeavors of this composer, Ukraine was worthily represented during that soiree. And so I started my interview with her Ode. How did you create this composition? How did you feel about the Wall? What was your composer’s message? “Schiller put it aptly when he said that all people would treat each other like brothers at one point. It was a very important opportunity to gather a great many people who would deliver this message. That’s why I write choral pieces – then a great many people become as one, the way humankind is united by Adam, when different individuals take a single shape. What about childhood? How did your creative life begin? “It never did. Recently I came across a romance to Pushkin’s lyrics ‘Have you ever heard…’ when digging up my archives, but it was when I’d learned to write music. Otherwise I was constantly in a music environment. How was I to live? Writing music was what I knew as life. So you had to wage a struggle against your parents, didn’t you? How much do you think this conflicting situation helped your composer’s talent? You must have been a rebellious teenager. “Right, and this must have started in my young years. I kept living a two-sided life. I was a dull reticent kid in the adult world, so going to school — and even afterward — was living in hell. I had to play the part of an obedient girl, sit with all of them, listen, and nod my understanding, yet deep inside I was seething with hatred. You have written a number of choral pieces using Church Slavonic. Is this a creative trend or religious dictate? Singing appears to occupy a special place in your system of values, as a separate philosophy. Is this paradise on earth isolated from other things? “It is, because it is paradise on earth. I have an online chat buddy and he once said that he feels like a perfect dummy in every respect. I’m just like him, a dummy, even if well clothed and placed. There is a great void within, Now and then I try to fill it, but after filling it I start missing this void. What I have to offer the world is just these fine clothes on a dummy; I can make them look even better or simply keep displaying them to stay in touch. So then your music emerges from that void? “Yes, it does, and then returns to that void. Well, this concept was formulated a long time ago. That which is tangible and acknowledged no longer exists. The trouble with me is that I have to fit my inner trends into concrete shapes. I have to put together an orchestra and choir, and elbow my way through this crowd to express something that has no shape. It’s still a mystery to me. “What makes me move all these heavy masses, move all those mountains, or find a way through them, considering that all this could have been made in a much simpler way? I want to express things that can’t be expressed, things that have no weight. I could simply swim with the current and this would be appreciated as my self-expression. Well, there must be something else, something I can’t identify for want of an identifying device. Yes, I guess that’s the reason. So where is the starting point when creating a composition? “Always in a different place. The aging processes, meetings, reading books, sentiments, trying to explain various situations, periods of depression. All this is eventually put together and has its effect. My music often has to do with specific individuals. As a rule, I keep all this to myself, without sharing any of this with other people. All these other people find their reflections in me. An expression on one’s face, a phrase, a look can start my inner engine. Then I start writing music. Are the urban or rural environs having any effect on your creative work? What about temporal relationships? Are they different? Whom do you address your music	to?